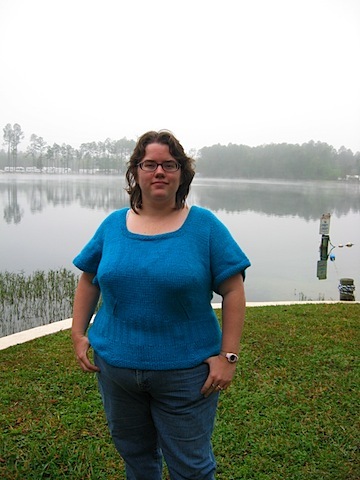 This is the very first sweater that I ever knitted. I finished it on Friday afternoon. The pattern is called “Bombshell,” from Big Girl Knits and is very shapely. It’s a little awkward at the neckline, but for my first sweater, it’s pretty good. Actually, I think it’s pretty good for any sweater on a big girl, but especially for my first sweater. The pattern is a top-down sweater with raglan sleeves. I added shaping in the bust area to accommodate my own personal amount of sweater meat. The book has information on how to do that, but the info is for bottom-up sweaters. I had a day of knitting and frogging when I realized I needed to turn the instructions upside down for a top-down sweater. I also made the arm holes a little too big, and they show my bra when I lift my arms. Since the neckline also shows my bra, I’m guessing that this sweater is a good one to wear with something very pretty underneath. I picked this color, by the way, because I wanted some blue in my wardrobe, and because it was on sale. I didn’t want to knit my first sweater and feel like I had to finish it because I’d otherwise be doing something bad to the yarn. This way, if I utterly hated it, I could burn it without remorse. The whole sweater cost less than $20 in materials. The yarn, incidentally, pilled like crazy in the wash, and it did shrink a tiny bit. Everyone says superwash stretches, even this superwash yarn. Perhaps that’s true on the second wash, but on the first, it just kind of snugged up the stitches. The next sweater I make will either be a more traditional cardigan that I adjust for Big Girl sizing, a pattern from Big Girl Knits, or possibly another Bombshell. In any case, the yarn will not be as garish. I love the colour, but then I like anything in blue. I think that it’s super fantastic that this is your FIRST sweater. Wow, what a terrific job you did on it. Great job and it looks good on you! I’d have to agree! That sweater was a masterpiece and does lood good on you! Great job! Blue fits you fabulously!